Here you can find all the information about a semester abroad. Please read the instructions carefully and direct any questions to us. If you are registering yourself for the first time receiving the link activating your account may take a while, please check your spam folder. If you registered in our online application portal beforehand, please use your existing access data/login. The application procedure for a study related stay abroad is conducted once a year in November/December. This is for the entire academic year: You apply at the beginning of December 2018 for a stay abroad in the winter semester 2019/2020 and/or summer semester 2020. 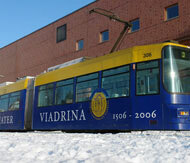 The Viadrina enters into agreements with partner universities. You apply to the Viadrina for a stay abroad in one of these partner universities. After our selections and your confirmation we nominate you for your chosen university. Then you apply directly to your chosen partner university. An application to, or contact with, the partner university before your nomination is not possible. Following the regular selection process an allocation of remaining seats will be held. Searching the semester times and major fields of study of our partner universities. Attending the International Day at the Viadrina and speaking with International students. Visit our Facebook page and group. We will happily advise you personally! Online applications for the Viadrina International Day go live. Deadline for submitting your application documents. If you have applied for a stay abroad outside of Europe (Non-EU), then in most cases you will be invited to a selection interview. Only in rare cases will you be invited to an interview if you’ve applied for a European stay abroad or a double degree. We will inform you of the result of the application procedure by email. This is not a final confirmation of the stay abroad. The ultimate decision lies with the partner university, who will be informed of our selections. In most cases our nominated students are accepted. The deadline for accepting or declining your offered place. Release of the left over places. Second round starting mid February. Third round will be the "first come, first serve" procedure staring in the beginning of April. At information events we will explain the further procedure. You will receive practical information on studying, recognition of courses and living abroad. This information event is very important and attendance is compulsory. We nominate you to your chosen partner university. You will then receive information concerning the necessary application documents that must be submitted to the partner university by a specified deadline.